1052 pages. No page numbers on printed issues, page numbers refer to the page in the file. 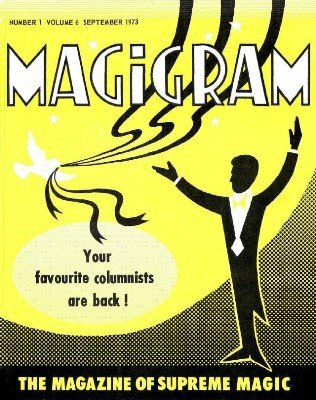 Volume 6, Number 1, September, 1973, 80 unnumbered pages - Your Favourite Columnists Are Back! W. Noel Jones and "Just Chance"
A Double Diamond Works ...! The Voodoo Rites of El Shama - or - Back to Where it All Began! Volume 6, Number 4, December, 1973, 84 unnumbered pages - A Merry Christmas to All! Volume 6, Number 5, January, 1974, 84 unnumbered pages - ... and a Happy New Year! New Mental Effect [Pre-Clip-Tion] Gets the Raves! Whizz 1974 - A Wizard Show! Some Ideas from Mr. E.
Some "Hanky Panky" from Stewart Judah's "Bag of Tricks"
Mason Reese - Magic's Friend - Profile by George Gore, Jr.
A Rope a Ring and a Spectator! Pentagram ... at the London Society of Magicians - Charles Bertram, Jr.